Rainbow for Japan Kids, a special project that focuses on supporting youth affected by the earthquake and tsunami that stuck northeastern Japan March 2011. The program’s purpose is to bring affected students to Hawaii for physical and psychological relief and recovery as well as form lasting friendships with children in Hawaii, group activities included visits to local schools, joint camp stays, and various activities around the islands. It is our hope to create a lasting rainbow bridge between Japan and Hawaii so these children will experience the spirit of Aloha and return home with new hope to create a better future for themselves and their communities. Since 2011, more than 120 children from northeastern Japan have participated this project. 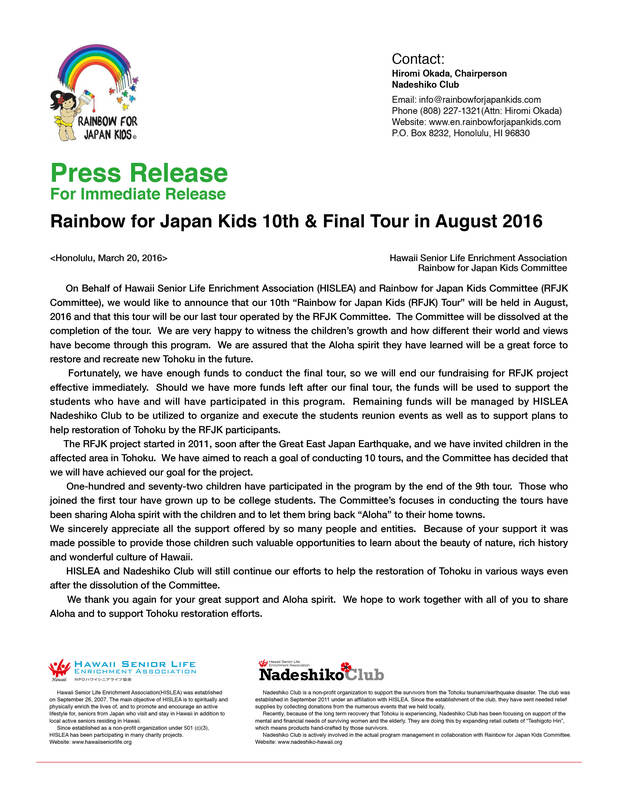 Year2016 Raibow for Japan Kids #10 Tour will hold in July.